Partyborough!!! We are kicking off September with a craaaazy back to school jam!! 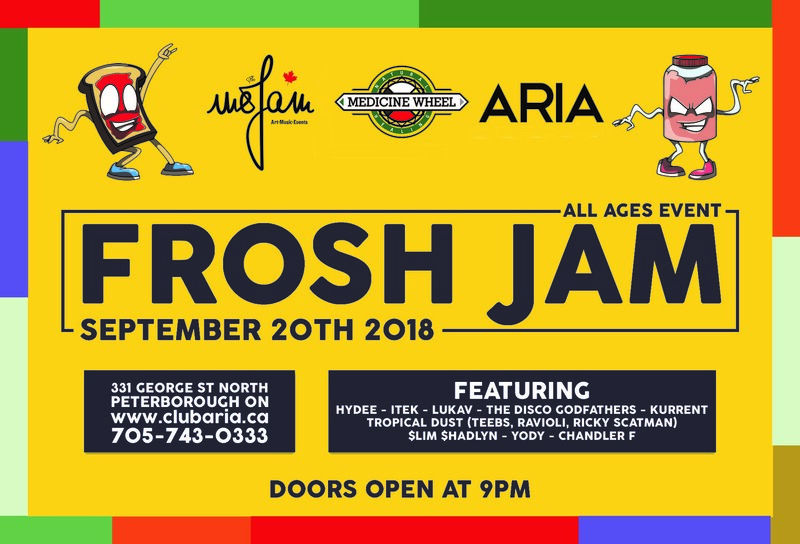 Trent University students, Fleming College students and party people of Peterborough, Wejam is hosting the city's only All Ages Frosh event!! We curated a festival like lineup with some of Ontario's best!! Hydee, ITEK, LUKAV, The Disco Godfathers and Jamie James have all blessed some of the biggest festivals and events in our province!! We also have an incredible selection of local artists as well!! DJ Chandler F, Pete Thibault & Noah Henderson representing Tropical Dust and Wejam Residents Yody & Riley Shadlyn will be grooving in the ARIA Underground!! Each ticket purchased will be entered into our raffle draw for your chance to win some cool prizes! We will also be having a 50/50 draw as well! Stay tuned for more information in the upcoming weeks. Tickets will sell out so make sure you reserve your spot at this wild event!